Patrick is expected to announce the launch of a $1.3 billion procurement for the new cars at a Tuesday morning meeting of the Greater Boston Chamber of Commerce, in addition to disclosing that toll money will be used to straighten the Allston section of the Massachusetts Turnpike. The Allston renovation will eliminate turns before and after the toll booths to alleviate traffic congestion. In addition, Patrick will also announce that the Allston section of the Pike will undergo an overhaul that will straighten the roadway to allow commuters to more easily pass through the area. “We expect that we will be able to significantly improve traffic in the neighborhood,” Davey said. That construction project will open up 60 acres of new development in the Beacon Park Rail Yard area. A Master Plan for Good Jobs | Opinion | The Harvard Crimson: "as Harvard moves forward with its plans to build, among other things, a hotel and conference center in North Allston, it has the responsibility to bring good jobs to the Allston community." Harvard Secures Donor for Campus Center - "Holyoke Center" coming to Allston? Harvard now has a sizable portion of the money it will need to convert Holyoke Center from Harvard offices to a student campus center. Where will all those office workers go to make room for the student center? "The Harvard administration has secured a donor for a campus center and will soon begin planning for its development, University President Drew G. Faust told The Crimson earlier this week... She also said at the time that it would likely be built in Holyoke Center and contain a variety of spaces designed for everything from parties to lectures and studying." Earlier this summer, the Department of Conservation and Recreation’s (DCR) Historic Curatorship Program put out a Request for Proposals (RFP) for the historic Charles River Speedway HeadquartersBuilding in the Allston/Brighton neighborhood of Boston. 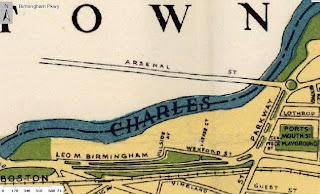 The Headquarters building, built in 1899 is all that remains of the Charles River Speedway. The Speedway consisted of a mile long race course for horse cart, or “sulky racing” as well as a course for bike racing. 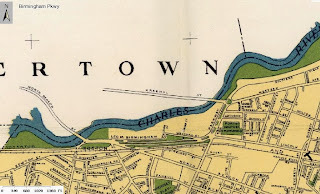 It was developed in the wake of increased automobile traffic on other main roads like Cambridge and Beacon, which had left little room for recreational vehicles. Until the 1960’s, the Speedway stretched all the way to the Harvard Football Stadium. After that time, with no more Speedway to look after, the Headquarters building fell into disrepair. However, it is a beautiful building, with a great story and a layout that offers many options for redevelopment. With this in mind, HBI just finished a submission for consideration by DCR. "While education and entertainment are important, residents dealing with business closures, construction sites, and a rapidly changing neighborhood demographics deserve benefits related to housing, employment, and transportation....However, it would be a shame if Harvard simply used these millions to construct resources that were useful only to Harvard affiliates." 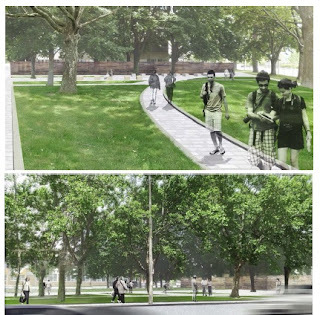 "This IMP hits all the fancy buzzwords including but not limited to "greenway" and yet there's absolutely no vision (the massing and future layout of Barry's Corner is completely bungled) and no clear benefit for Harvard either. This IMP strikes me as a fancy placeholder so that they can continue to landbank here (with a planning horizon counting in centuries, not years)." Harvard hasn't announced the new design for the Western Ave Science Complex that is possibly re-starting construction for next year. But it is interesting to see how it is shown in Harvard's Master Plan and how different it is than the previous design. There's been a lot of talk about making big changes to Smith Field. It is interesting how Harvard shows Smith Field in this 3D rendering of its 10 year plan. Looks like a Little League field, two softball fields, a baseball diamond, and a basketball court. Ten years from now I sure hope Smith Field has a lot more diversity of facilities than that. Harvard's IMP shows many 3D renderings of what its campus and Barry's Corner might look like in 10 years, but there are no such renderings showing what things will look like for the next 5+ years. And 5 years is quite a while. So I've color coded the map on page 101 of Harvard's Master Plan with the phasing information on page 112. The takeaway is that Harvard's 4 IMP projects between now and 2018 are relatively small interior projects at Harvard Athletics and HBS. It isn't until 2020 that we might see new construction in Barry's Corner that could enliven this area. If it is going to be 6+ years before these buildings begin construction, it becomes all the more important to ask what will happen on these sites in the meantime to contribute to a strong and vibrant community. What are the "BTD Bike Plan Elements"? This is an interesting image from Harvard's IMP. It makes it look like there are a great many transportation improvements coming to most all the major roads in our neighborhood. But can this be true? What could BTD (the Boston Transportation Department) have planned for "bike plan elements" on narrow, high-speed Lincoln Street? If the overhead wires were buried, the utility poles removed, and the road widened towards the Mass Pike to create space for physically seperated bike lanes that would be a great improvement. 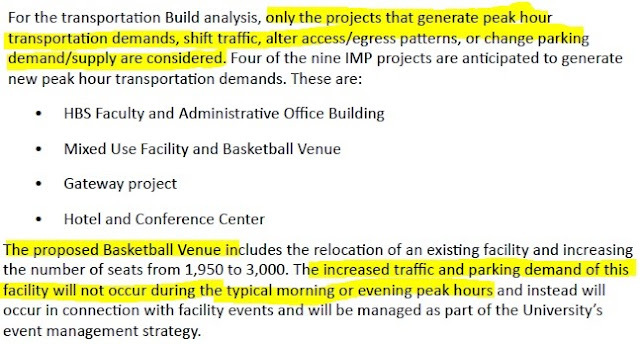 That would also be a multi-million dollar project that I haven't heard seriously discussed. If the plan it just to paint "sharrows" in the existing lanes then that really isn't going to accomplish much. 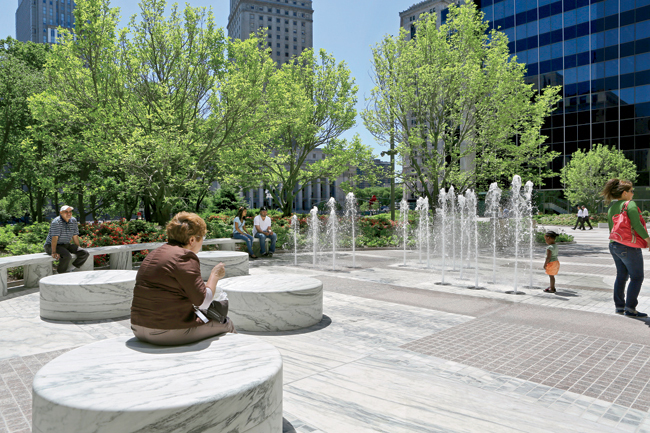 The Bloomberg administration has certainly not been tone deaf to place-making during the last dozen years, transforming many city parks, waterfronts and plazas, and embracing sustainable design. But its plan for East Midtown fails to recognize a fundamental paradigm shift. 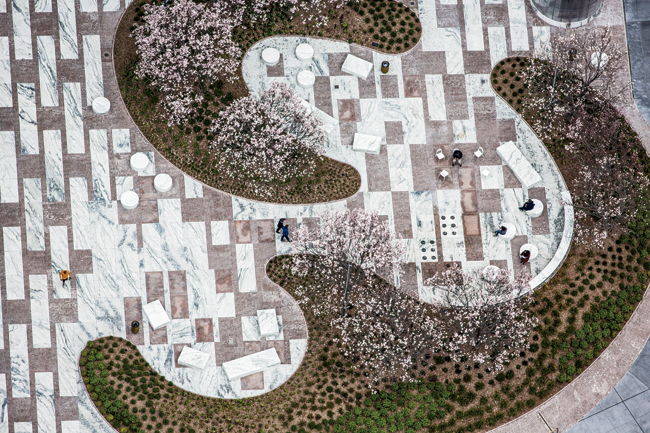 The focus in designing cities has now turned from buildings to the spaces between those buildings — sidewalks, plazas, parks — whose disposition requires planning. Harvard's "gateway" building isn't planned until 2020 at the earliest. Here is what Harvard proposes the area will look like until then. It will be nice to have the existing chain link fence removed, but this seems to fall far short of the award-winning public space that it could be. Harvard wants to build a 3,000 seat basketball arena right near the intersection of Western Ave & North Harvard Street. This intersection is already frequently congested and difficult for drivers and pedestrians. Harvard has decided, that because heavy use of the facility may not occur during the "typical morning or evening peak hours" that it can therefore pretend that this 3,000 seat arena will have no traffic impact at all. Of course Harvard rents its athletic facilities to many non-Harvard organizations, and things change about when and how Harvard facilities are used. It wasn't that long ago that Harvard Stadium was used only during the day. It is fine if Harvard wants to build a grand and glorious basketball arena and rent it to private teams, organizations, and events. But Harvard could also admit that this will bring new traffic into our community and that merits study and roadway improvements. By the way, what is "the University's event management strategy"? Is that strategy what causes situations like this? Can Harvard students not cross North Harvard Street safely? The Allston/Brighton community and the BRA have both asked why a new Harvard basketball arena is the best use of land in Barry's Corner. It the "site selection rationale" of its Master Plan, it is interesting that Harvard describes North Harvard Street as a busy and dangerous street that poses a grave safety risk. I have crossed North Harvard Street countless times, pushing infants in strollers, with young children riding bikes, in bad weather, and more. It would be nice to have a crosswalk with walk signal at the Honan Library (as an alternative to the one at the one at Easton Street). But when compared to Western Ave, Cambridge Street, and the other major roads in our community, crossing North Harvard feels relatively easy and safe. I doubt that Harvard students, who have to cross many busier roads (like Memorial Drive) on their walk from Cambridge to Allston, would have a safety problem getting across North Harvard Street. The site of the current Charlesview Apartments is one of the most prominent gateway locations of our neighborhood. It is a shame that Harvard wants to put a big surface parking lot there. Also, the building shown in the left side of the images below (Harvard calls it the "Gateway project") is not scheduled to be built until 2020 at the earliest. There seems to be no proposal for how these ~8 acres will enrich the community and Barry's Corner for the next 6+ years. Harvard Allston Task Force comment (Nov 19, 2012) - Harvard Parking Lot on the site of the current Charlesview housing - This proposed use shown on page 35 of the IMPNF is completely unacceptable. A large surface parking lot in this strategic and highly-visible site is completely contrary to our vision for North Allston. We strongly oppose Barry’s Corner being the backside of Harvard’s campus where undesirable uses are dumped. Harvard has suggested that this site could also be used for construction activities such as material storage, staging, and parking. We disagree with this proposal, especially considering the pending vacancy of the CSX and Romar sites which would give Harvard other nearby options for parking and construction activities. And here is Harvard's proposal. It is quite deceiving for the parking lot to be drawn in light gray in two of the drawings which does not make it look like asphalt. The 3D view shown on top was drawn by Harvard's consultants so that it only shows 1/2 of the parking lot. How does this make any sense? These parking lots exit onto North Harvard Street and Academic Way. The cars that use the Academic Way exit will then have to exit onto Western Ave. So how does this minimize impact on adjacent streets? Visually, a single row of trees along North Harvard Street doesn't minimize much of anything. What does it mean to integrate parking lots and driveways into "the network of pedestrian paths in the Ten-Year Plan to minimize pedestrian and vehicular conflicts"? Meet the Mayoral Candidates: How would you ease apartment overcrowding? "This week, we asked Boston's mayoral candidates what they would do to ease overcrowding in neighborhoods like Allston. Here are their answers. Add your thoughts to the comments or tweet at the hashtag #BosMayor." The Ward 21 Democratic Committee officially endorsed Councilor Mike Ross for Mayor on Thursday. The committee, made up of Democratic activists from parts of the Allston, Brighton, and Fenway neighborhoods, cited Ross’ innovative ideas as key to the endorsement. Nine of the 12 candidates for Mayor filled out the Committee’s questionnaire, which addressed topics such as education, housing, institutional expansion, open space, and transportation. Those candidates, including Charlotte Golar Richie, John Connolly, and Bill Walczak spoke to the community before the Committee vote on Thursday. In the end, Councilor Ross received more than enough votes to qualify for an endorsement. “I’m honored to have the support of the Ward 21 Committee, and I look forward to working with them in the months ahead. Grassroots support will be key to this campaign, and I’m happy that my desire to bring new ideas to city hall is resonating,” said Ross. In June 2013, the Ward 21 Democratic Committee sent questionnaires to all candidates for mayor, city council at-large, and the city council seats in Districts 8 and 9. They asked campaigns to return the questionnaires by July 8. Use the link below to see the responses received as of July 9. They will post any additional responses as they receive them. With all this summer heat I know it can be hard to think ahead to Boston's election for Mayor this summer. But now is a great time to get to know the candidates and show them how much we care about making Allston and Brighton and all of Boston a better place to live! I have known John Connolly for several years and have consistently been impressed by his involvement in the Allston and Brighton community. He is now a leading contender in a crowded field of candidates running to be our next Mayor, and we need a Mayor who understands our neighborhood and who will work hard to improve our quality of life. Please join John for an Allston-Brighton Neighborhood Party on Thursday, July 25th at 6:30 PM at Devlin's (332 Washington St in Brighton Center). Whether you are already supporting John, considering who to support, or just starting to think about our next Mayor, I hope you will join us to learn more about John and his vision and experience. 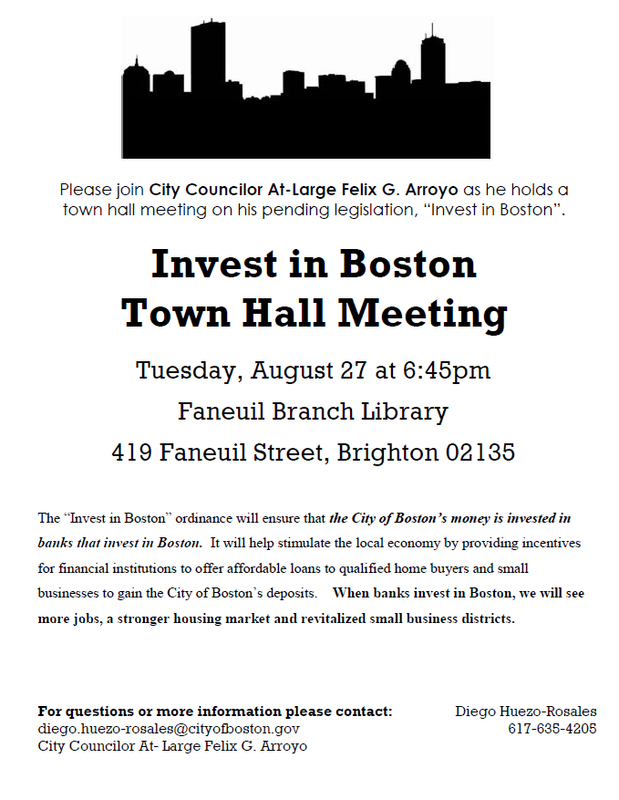 More details and a list of scheduled candidates will be posted at www.bostonward21.org when the events get closer. Gerald Autler, senior project manager at the Boston Redevelopment Authority, said on Monday that the task force would have a 60-day period to provide feedback on the master plan [that Harvard will file in July]. But task force member and Allston resident Bruce E. Houghton railed against Harvard and the BRA for expecting the task force to identify the benefits they want included in the plan in what he described as an unreasonably short period of time. The City of Boston Parks and Recreation Department is reaching out to the public and to users of the parks, playgrounds, and other open spaces in the city, whether or not you reside in Boston, to learn about how they use open space in Boston and how we can improve their experience. There's a lot coming our way in the next several years. What did I miss? What are your thoughts on these projects? 11:00 on Saturday morning and Western Ave is jammed in both directions from North Harvard Street to the Western Ave Bridge. Way too many cars per minute are trying to enter the Harvard Business School parking lot. Once complete, the bridge will include a 10-foot-wide sidewalk on one side, nine-foot-wide sidewalk on the other side and six-foot-wide bike lanes abutting each sidewalk, officials said. Between the bike and traffic lanes will be a three-foot-wide buffer. Each of the four total traffic lanes will be 11 feet wide. A six-foot-wide median will divide the bridge’s travel lanes. Instead of Central America, What about Allston? The proponent will work with Harvard, the City and the community to explore how public art can be incorporated into the project. So kudos to Mr. Stenson for suggesting that Harvard think locally about the importance of the arts. "John J. Stenson Jr. of Brighton asked the first question after [Harvard Romance Languages and Literatures Professor Doris] Sommer wrapped up her lecture, demanding to see funding from the University to promote theater in Allston. “Never mind about Bogotá. What about right here?” Stenson said. “Put a play on here. That’s your challenge.”"
There is plenty of decisions about Harvard's Allston expansion that should be driven by purely internal Harvard decision-making. I think there are also plenty of issues relating to the public realm along Western Av & North Harvard St and the too many blighted Harvard properties all over our neighborhood where some the community should have a role in the decision-making process. "...faculty have not been consulted on a range of important decisions over the last year pertaining to the Government 1310 cheating case, the relocation of the School of Engineering and Applied Sciences to Allston"
"history professor Lisa M. McGirr said that the monthly meetings have become something of a “spectator sport” in which faculty watch as administrators break news about their decisions." "Asani agreed, saying he believes the Faculty Council—and Faculty meetings more broadly—are too closely controlled by administrators for professors to have a free and full discussion." "Computer science professor David C. Parkes, a co-chair of the Transportation Task Force alongside Executive Vice President Katie N. Lapp, wrote in an email that while the task force has not yet convened, it will eventually investigate a “multimodal transportation solution” to connect Cambridge and Allston." “Lesley’s main goal is to provide the best overall experience for our student-athletes, and state-of-the art facilities are key,” [Amanda McGregor, spokeswoman for the university] said. “[Barry’s Corner] is going to rise out of the Earth, and we’re going to have nothing to show for it,” task force chair and Allston resident Ray V. Mellone said. After some discussion, task force members rallied around the idea of tying improvements of Smith Field, a park adjacent to the site of the planned development, to the development of Barry’s Corner. BRA Chief Planner Kairos Shen said that the agency would explore language that could require a commitment from Harvard to renovate the field in order to receive BRA approval for the Barry’s Corner development. Shen and task force members agreed to try to come up with a provision by the time the project faces evaluation from the BRA. "[Executive Dean for Administration G. Timothy] Bowman also said that he hoped the SEAS Allston campus would develop into a “college student hub” for students coming from the iLab and Harvard’s athletic facilities. “We want it to be a destination that students, faculty, and the University community want to go to, even if they don’t have a class,” Bowman said." I wonder what Dean Bowman thinks would make Western Ave a "college student hub"? Will the Allston community also want to go (or be invited to go) there? The previous plans for the Science Complex had Harvard-only amenities like a private rooftop restaurant & bar. Finnegan's Wake from The Vaudeville Puppets on Vimeo. Start a community planning process this April to build its promised Rena Park and begin the first phase of the park’s construction in 2014; develop a comprehensive master plan for campus services, which would clarify that the 28 Travis St. relocation project is temporary; implement that campus services master plan within one year after the university opens its proposed science complex in Allston, which is scheduled to open in about five years; and to not run vehicular service between midnight and 6 a.m. at the 28 Travis St. site, Shen said. If Harvard fails to comply with those conditions, the city would withhold occupancy permits for new buildings the university builds until the school is in compliance." Huge Russian Parties coming to Linden Street? The "Russian Benevolent Society" will be at the Zoning Board of Appeal on March 26 seeking to increase their capacity for a "restaurant / lounge with live entertainment" to 450 people with outdoor seating for 90. I wonder what they will do in 2014? "Mattison said that Harvard had promised to place a three-acre park where Barry’s Corner meets the residential community, but that the University is now reneging on that promise." merriam-webster.com defines "renege" as "to go back on a promise or commitment". "Adjacent to the Allston library on North Harvard Street will be the largest open space in Rena Park"
Notice how during the last 4 years Harvard lost the big piece of Rena Park near North Harvard Street, the Honan Library, and Mellone Park? 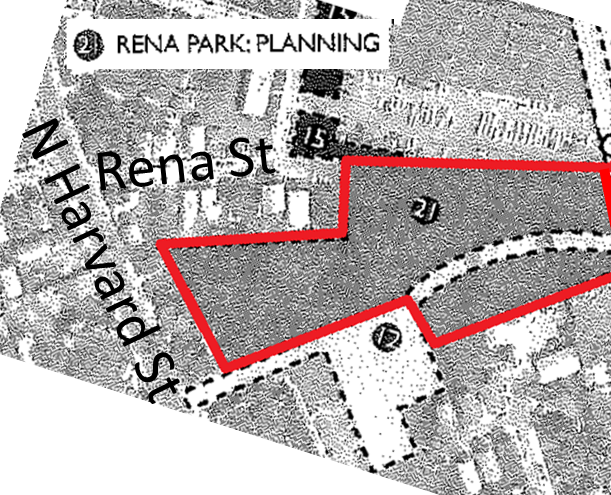 There is a little tail of "Harvard Campus Landscape" extending to the east, but no "Public Open Space" where Harvard promised the largest open space in Rena Park.